A friend of mine called me at four in the morning. He is on Eastern Time, six hours ahead of us, and didn't realize it was 4am for me. I walked outside, so I wouldn't wake my wife. As we talked, I looked straight up noticing the moon and how bright it was. Then, as I lowered my head I noticed this bright object way off, like a star, but much brighter. I could see two nearby stars to use as reference points. The object was very bright and had a symmetrically shaped bright swirl on both sides of it, a mirror image of each other. The object as well as the aura surrounding it moved South in the sky maintaining its size and shape the whole time. I ran inside and brought my wife outside to see it. As we watched it, it continued to move south and grew in size getting much bigger than it originally was, yet maintaining its shape perfectly. It finally began to fade in brightness and eventually just disappeared completely, before leaving our line of site. While I watched the object I took two pictures. One at normal focus, and then I zoomed in and took another shot. Mufon case file 87251. 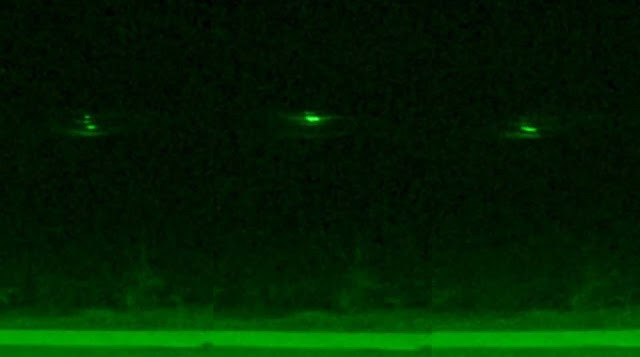 One day later a photographer captured a UFO-like circle in the night sky over Nordendorf in Germany. The object that appears to consist of three spheres surrounded by a circle gradually changed into one sphere while the circle slowly faded away. Mufon case file 87263. As a Hypnotherapist, Barbara Lamb has discovered that several of her clients have suppressed memories of a program where their genetic makeup has been enhanced with extraterrestrial DNA. Throughout her career, she has helped thousands of people revisit their past lives. For some of her clients, something extraordinarily unusual was discovered about their present lifetime. Many have had encounters with otherworldly beings, and a number of those have had startling similar experiences which revealed that they have been subjected to extraterrestrial hybridization programs. Barbara Lamb is a Certified Hypnotherapist and Regression Therapist who specializes in Regression Therapy with people who experience encounters with extraterrestrial beings. During his time along lake Ontario shores a man found some interesting rocks that do not fit the normal parameters of Lodestone or Hematite, there is no reddening of the stone and it is not black but grey. These stones have magnetic poles and seem to be carved.,they are almost as heavy as solid iron. Where do these stones come from? Stunning footage reveals the moment the moon appears to SWALLOW Saturn before it re-emerges almost two hours later on March 29, 2019. A space phenomenon which saw the moon 'swallow' the gas giant Saturn has been captured in stunning footage. The bizarre event saw the ringed planet eventually re-emerge from the other side of the moon - completing a process called occultation. This celestial event lasted for 1 hour 44 minutes and was captured by photographer Cory Schmitz in Johannesburg. Schmitz: The raw view through my planetary imaging telescope from South Africa of the Saturn conjunction and occultation by Earth's moon on March 29, 2019. Telescope: GSO 12" Ritchey Chretien (RC) Mount: Celestron CGEM-DX Camera: ASI290MM + color filter wheel. My fiance told me to turn around and look at this craft in the sky. I stood there in shock until I thought to reach for my phone. When I first saw it, it was moving slowly and seemed very close as it was huge. 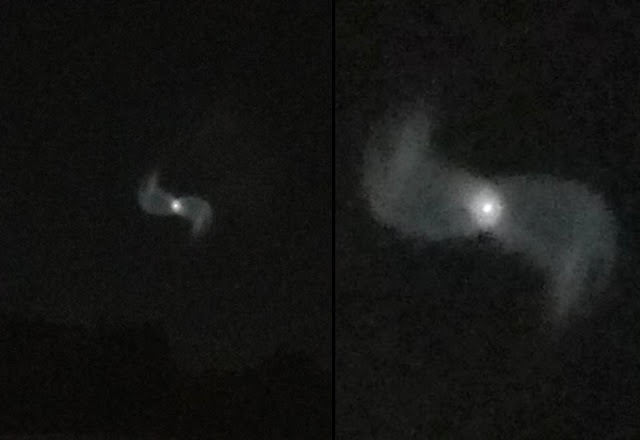 It stayed stationary, then seemed to rotate slowly as it raised higher and the lights went out one by one. I never saw a definitive shape and it looked as if it literally disappeared. It was like the craft, possible a TR-3B, blended in with the sky except for the lights. there was no sound at all. the sighting lasted about 2 minutes. Afterward, I heard first then saw two helicopters going toward the sighting. I then went inside my home. Lucas Kim was jetting to Thailand from his home in Seoul, South Korea, when he spotted what he thought was another flight from the window of his Jeju Air plane. When I looked closely, it was not a plane - it was six individual vehicles. It was like a pulsating greenish-yellowish light,' he said. In the footage, the UFO is first visible as a distant, white dot beyond the wing. But as he zooms in, it quickly becomes apparent that there are several points of light, moving in formation like no regular aircraft can. Moments later, they split into pairs and disappear from view. During a flight from the Netherlands to China a passenger named Ming Yang suddenly felt something strange, and looked out of the window and noticed a silver-gray disc-like UFO in the distance on which he immediately pulled out the phone and took a picture of the UFO. 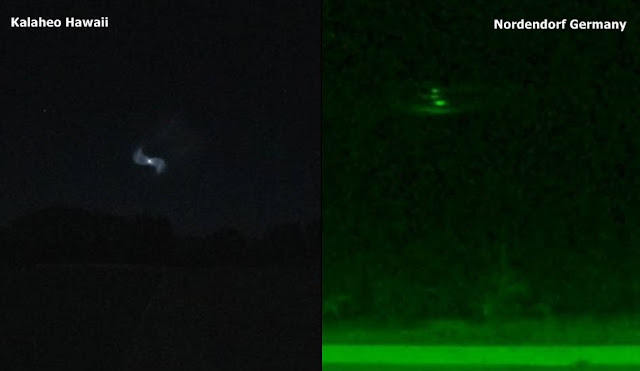 Based on the remarkable UFO sighting photographed on September 14, 2018, mp.weixin.qq. has worked out a detailed report and came to the conclusion that the location of the UFO was above the Shidou Reservoir. Shidou Reservoir which is a reservoir in Jimei District, Xiamen City, Fujian Province, China. They also have consulted a professional captain, Mr. Cheng Hui and according to his analysis the size of the UFO is about 120-200 meters and it was nearly up to 4,000 meters while according to the flight track query the KLM Boeing 787 was at 3,600 meters at the moment Mr. Ming Yang took the picture. We are in an era of tightening censorship and deplatforming of ideas that are unwelcome to the corporations and power elite at the top of our social and political hierarchy. At the same time, the UFO subject continues to slip out, more and more, into our public discourse. Richard Dolan argues that "disclosure" of UFOs is happening, albeit within a controlled setting, and of course lots of spin. GoingundergroundRT speaks to Graham Hancock about his new book America Before: The Key to Earth’s Lost Civilization. Graham Hancock has for decades been questioning the facts revolving around humanities past attempting to uncover what mainstream archaeology failed to even look at and is well worth a listen. He discusses how dogmatism in archaeology has covered up 130,000 years of human history in the Americas and evidence of advanced civilizations that lived in the Americas thousands of years ago, which challenges colonial narratives of uncivilized natives incapable of high culture.